Below we have an enquiry for a shower and toilet block log cabin for a camp site utility area. 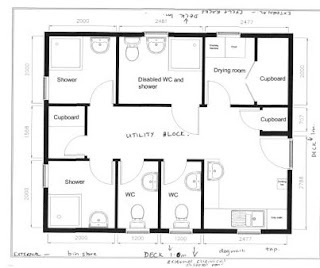 Complete with disabled toilet this is a cost effective way of settting up all the facilities you would need to get a comfortable campsite up and running. 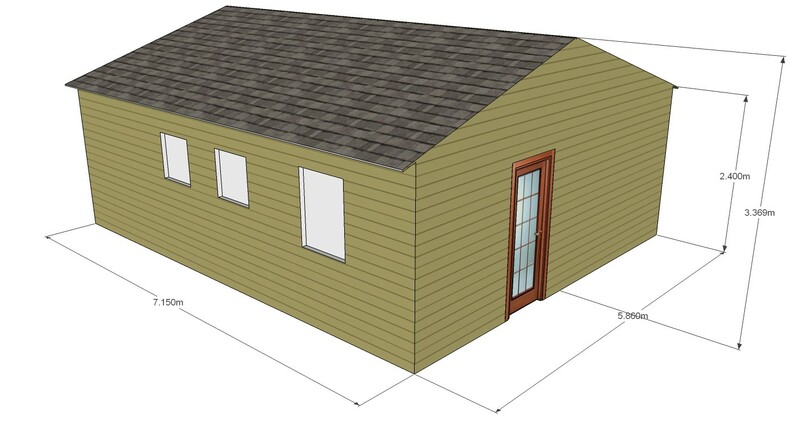 Initial plan drawing provided by the customer. 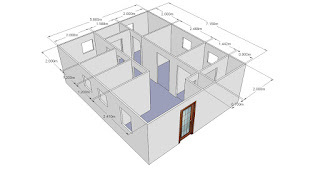 We can then produce preliminary drawings of the layout in 3D. 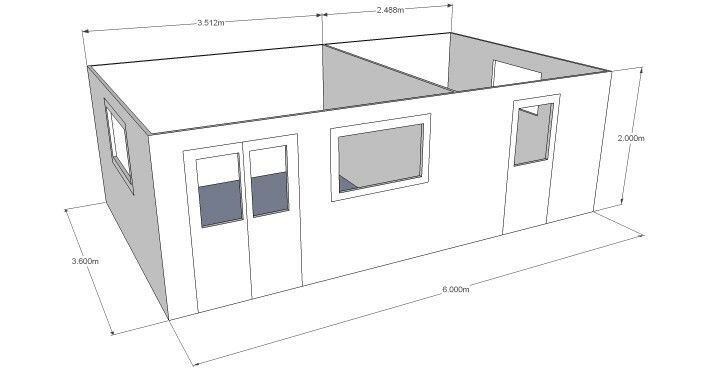 After initial rendering we can provide these drawings to the customer to help them visualise the final product and establish the finer details such as roof overhang, verandahs etc before submitting the drawings to the factory for final costings. 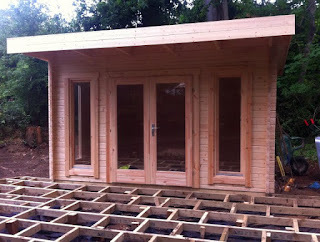 We are frequently dealing with customers looking for bespoke garden office designs. 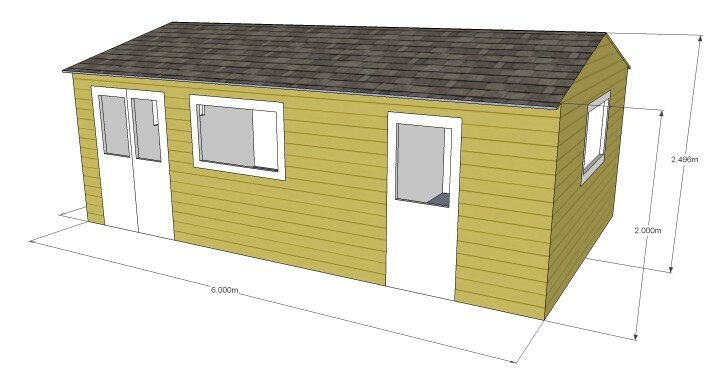 Quotations are available on receipt of a sketch. 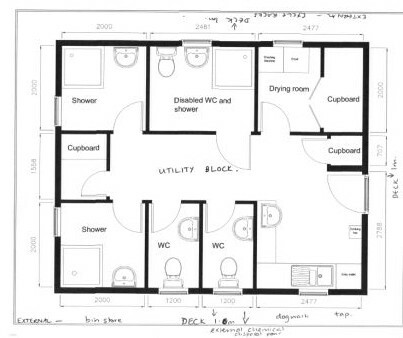 In some cases these sketches can be very basic but the more information the better. 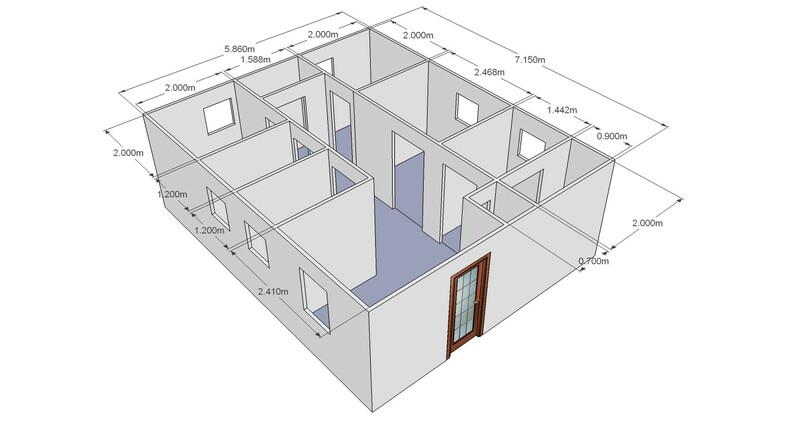 One free tool you may like to use is Google sketchup which is a very easy tool to grasp the basics of CAD. 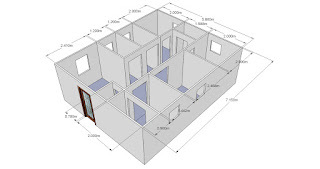 However if your IT skills are not up to it we should be able to get an idea from a pencil sketch posted or scanned and emailed. 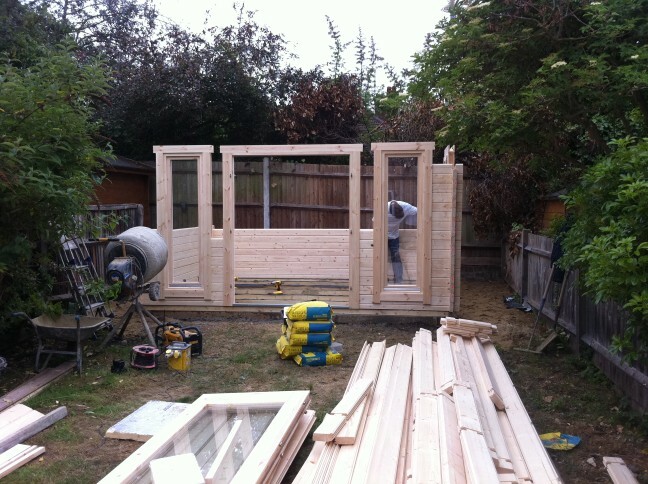 Ideally you will show a side, end elevation and a plan or birds eye view. 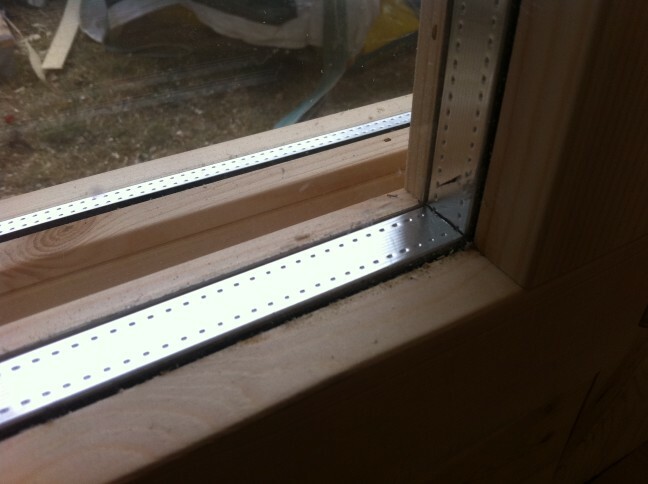 Then we just need to know the specification. 34, 44 or 68mm walls double glazing or single glazing. As a guide for installation costs simply compare with a standard garden office kit with a similar footprint and you will get a good idea of the costs. 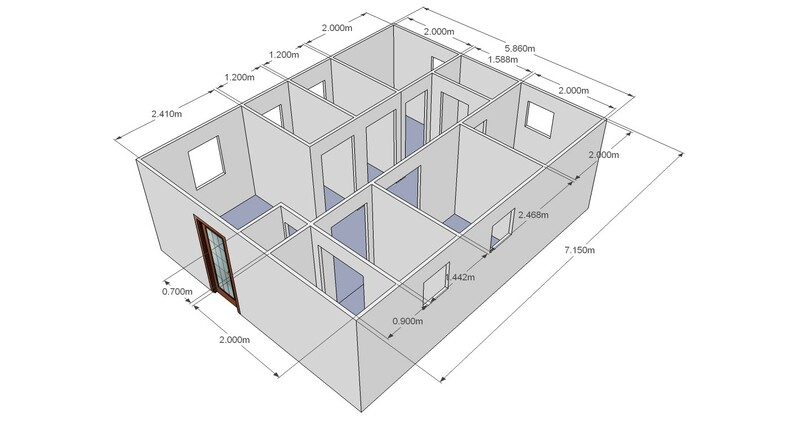 We will send you sketches prepared using Google sketch-up for you to review then these designs are passed onto the factory who then prepare formal CAD/CAM drawings for final approval by you before manufacturing begins. 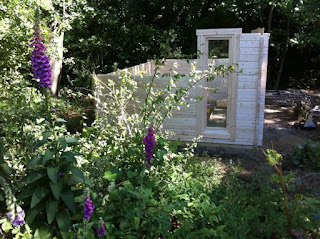 Popped back to Dunfermline yesterday to see a garden cabin we built in 2009. 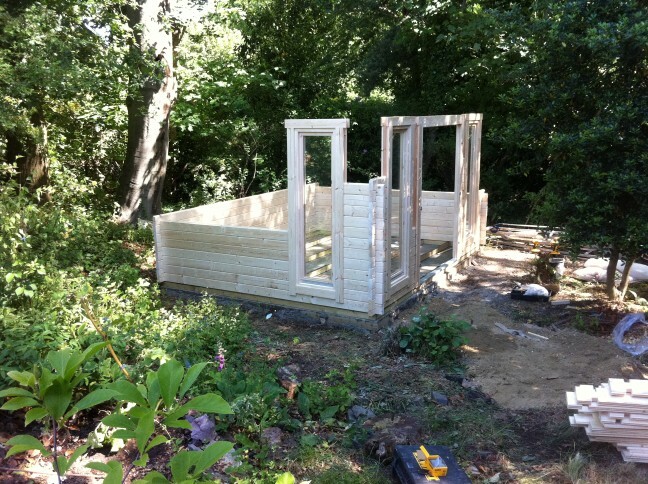 Looking as good as ever the space is very welcome with two young children and a third on the way the space to escape is much appreciated! 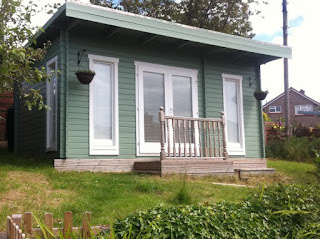 A garden office room gives you that extra space to escape. Our latest garden office installation in South west London in Surbiton. 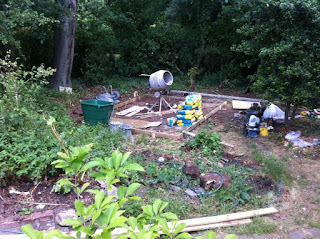 For a change we'll start with the finished product and work back towards the starting point. The log cabin is our very popular Cheltenham log cabin lowered to 2.5m ridge height for planning purposes. 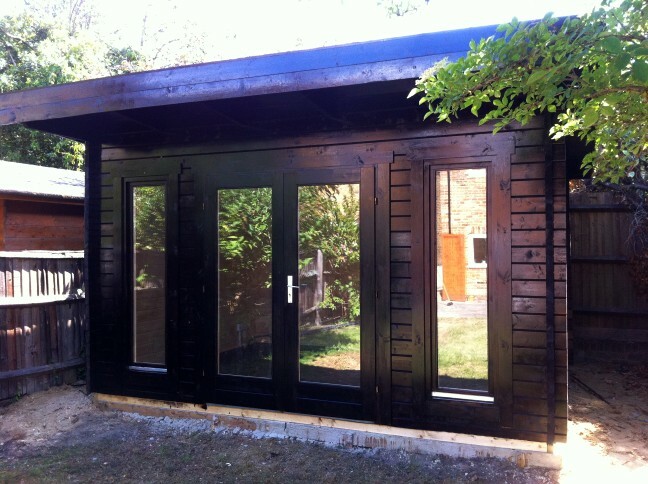 This cabin is finished in Jacobean walnut produced by Sadolin one of our two recommended paint manufacturers the other being osmo wood stain & protector. 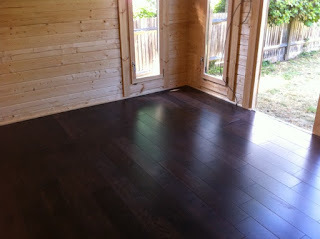 The flooring used in this case is solid oak 18mm real wood flooring produced by Wickes. 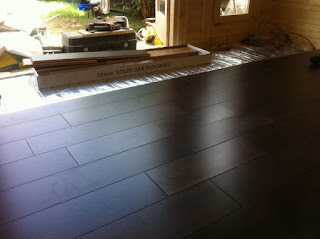 The completed floor really adds a touch of quality to the final product. 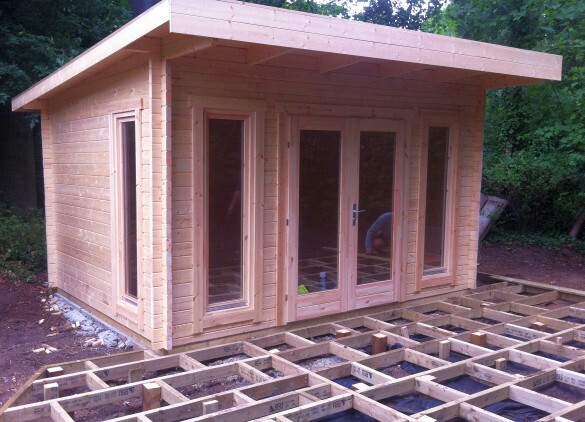 Supplied with underfloor heating this garden office should be cosy throughout the year. 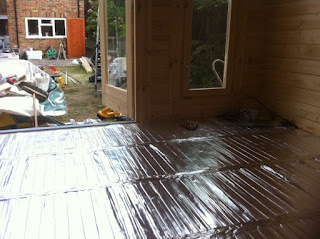 Both the floor and the ceiling are fitted with 50mm Celotex sheets. Celotex and Kingspan 50mm sheets are high quality insulation materials far superior to rockwool or the thin bubble foil sheets often called "insulation" by our competitors. 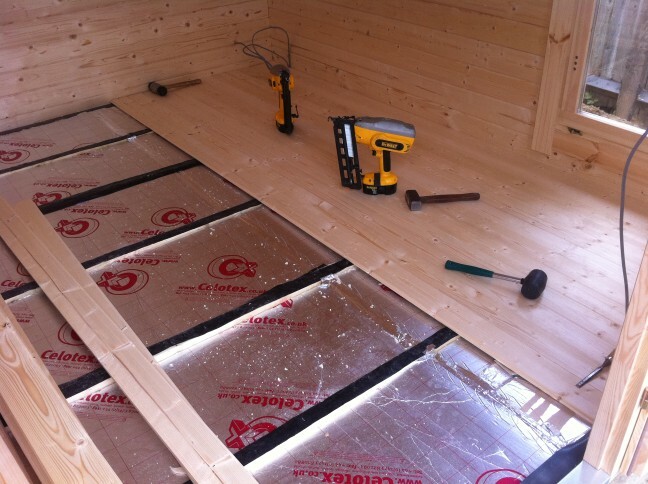 There is no substitute for the best insulation available. 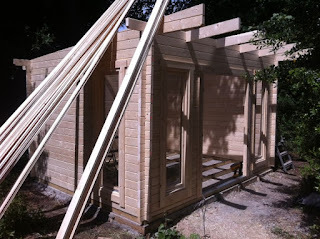 To be honest we do not get too hung up on the width of the double glazing units as we are dealing with garden buildings and the difference a bigger gap makes is minimal but as you can see the distance between the panes of glass in the Cheltenham log cabin is quite substantial. 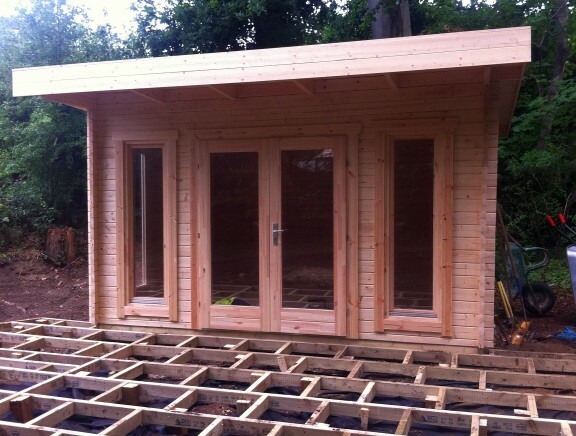 44mm logs provide a robust garden office and the quality of the timber is superb. Its not often you see a brick wall that isnt level but you can be assured the concrete base is level! 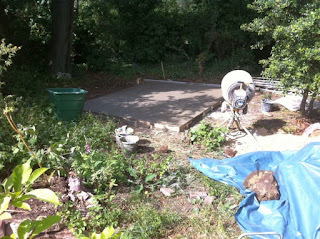 100mm thick concrete base completed. 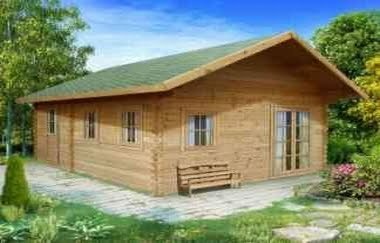 We are pleased to be able to offer a 10% discount on the Wales 4x3, Liverpool 5x4 and the Nottingham log cabin That is potentially a saving of more than £600 on our current listed price! Please contact us as soon as possible to avoid disappointment as there are only a few log cabins left at the discounted rate. 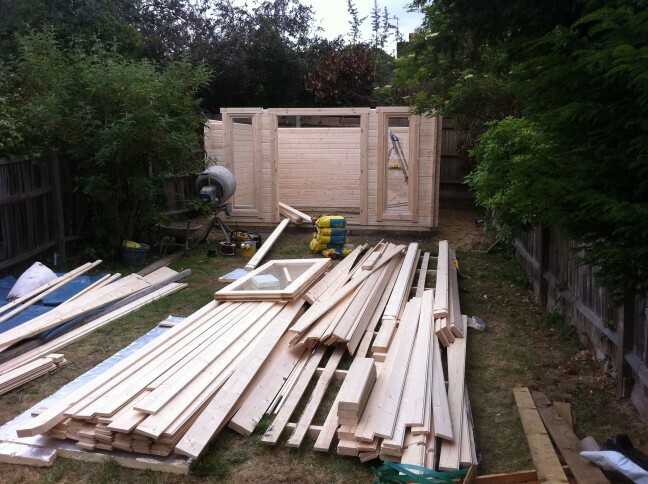 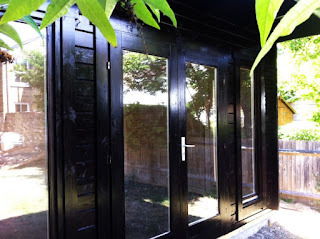 A tour of our garden office installed in Surbiton. Complete with insulation, underfloor heating and solid oak flooring it is a quality garden office at and affordable cost. Close to Esher College and Sandown Park for our recent installation in Thames Ditton. A lovely garden where you can forget you are inside the M25 not far from central London. 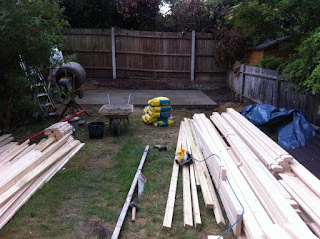 Day one is concrete base installation. 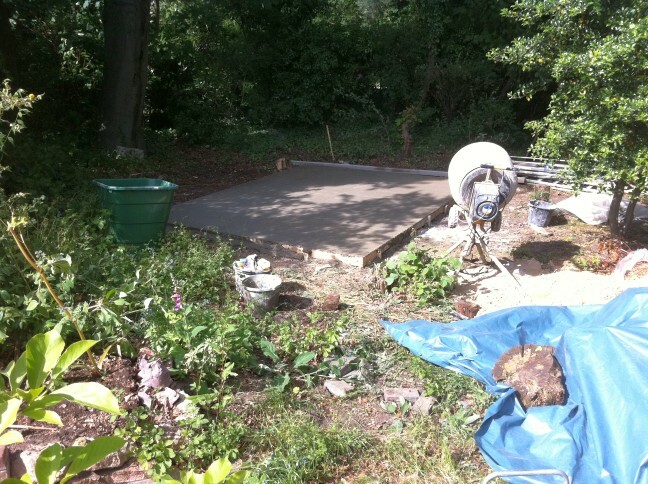 Concrete base complete and left to set before the cabin installation begins. 70mm pressure treated floor joists in position and damp proof membrane fitted ready for the walls. Soon up to half wall height and time to fit the windows and door frame. Mid afternoon and up to roof height ready to fit the tongue and groove roof boards. 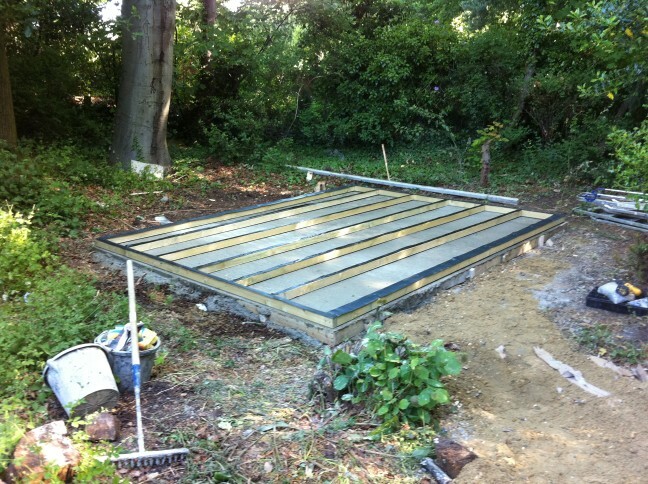 Bitumen roofing sheets fitted and ready for the doors and floor to go in. 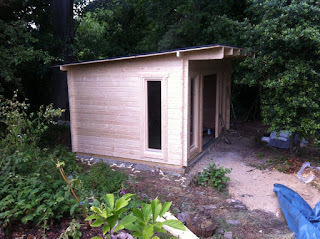 Trim fitted and the cabin is complete. Local landscapers are in the process of adding decking outside the cabin. A beautiful garden office log cabin could be yours in just three days!